As political discussions move into otherwise personal social media spaces, users are confronted with a range of social challenges, such as navigating posts from friends and family members that they vehemently disagree with or find offensive. This survey highlights the contradictions and tradeoffs (as well as benefits) of social media interactions in an era of widespread political polarization and partisan antipathy. For many social media users, this influx of political content is a source of frustration and annoyance. A substantial share of social media users are worn out by the tone and volume of political material they encounter on these platforms and view social media as an inherently angry and disrespectful medium in comparison to other venues for discussing politics. At the same time, a smaller group of dedicated political junkies view the political discussions they encounter on social media in a much more positive light. And even as they lament the day-to-day annoyances that go hand in hand with talking politics on social media, many users recognize that these sites can play a useful role in helping people get involved with issues and candidates that are important to them. Indeed, these spaces can even lead to users changing their minds about political matters: Roughly one-in-five social media users have changed their minds about a political candidate, or a social issue, because of material they encountered on social media. By a roughly two-to-one margin, social media users express resignation rather than excitement over the volume of political content in their social feeds. One-in-five social media users (20%) indicate that they like to see lots of posts about politics on social media, but nearly twice that share (37%) describe themselves as being “worn out” by how many political posts and discussions they see. The remaining 41% of social media users don’t feel strongly one way or another. This general feeling of resignation is bipartisan: A nearly identical share of Democrats (38%) and Republicans (37%), including independents and other nonpartisans who “lean” toward the parties, report being worn out by political posts and discussions on social media. One group of users in particular stands out as being receptive toward political discussions on social media: those who regularly discuss or post their own content about political issues. Some 39% of users who often or sometimes post their own political material on social media indicate that they also like seeing lots posts from others (although 35% report feeling worn out by how many posts and discussions about politics that they see). By contrast, just 11% of those who hardly ever or never post their own political content say that they like seeing lots of political discussion on these sites. In a Pew Research Center survey of partisanship and political animosity conducted earlier this election season, a majority of Americans (61%) indicated that they usually find they have less in common than they thought when they talk to people who they disagree with politically; by contrast, 36% find that they usually have more in common than they anticipated. When asked a similar question in this survey about the discussions they specifically have on social media, users respond in roughly similar proportions. Around two-thirds of social media users (64%) find that they typically have less in common than they thought when they discuss politics on social media with people they disagree with, while 29% indicate that they usually find that they have more in common than they anticipated. At the same time, this survey finds evidence that political discussions and arguments on social media can be stressful to many people in ways that in-person arguments are not. The survey noted above also included a broad question about how people view their interactions with those who they disagree with politically: In that study, 46% of Americans described these interactions as “stressful and frustrating” while a similar share (51%) described them as “interesting and informative.” By contrast, in this survey some 59% of social media users indicate that they find it stressful and frustrating to talk about politics on social media with people they disagree with, while just 35% say that these discussions are generally interesting and informative. 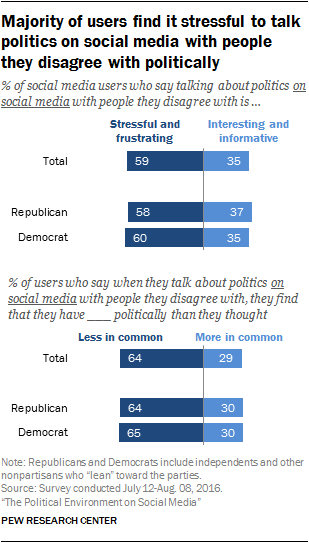 Democratic and Republican social media users are equally likely to say that it is stressful and frustrating to talk about politics with people they disagree with on these platforms. And users in both political camps are also equally likely to say that they generally find they have less in common than they thought with the people on the other side of these arguments. A substantial majority of social media users feel that people on social media act in ways that are at odds with their typical in-person demeanor. 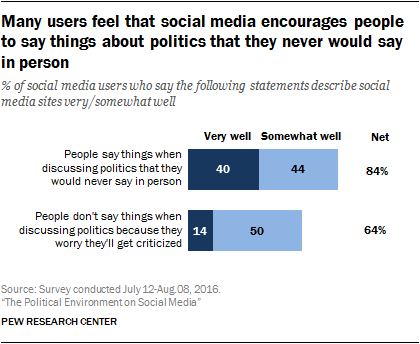 Fully 84% of social media users feel that the statement, “People say things when discussing politics on social media that they would never say in person” describes these sites either very (40%) or somewhat (44%) well. But even as they see social media as a place where people go beyond the boundaries of face-to-face discourse, other users – although a notably smaller share – feel that people refrain from speaking their minds about political issues on social media out of concern that they will lose friends or get criticized. Some 64% of social media users feel that this describes social platforms either very (14%) or somewhat (50%) well. As with many of the issues examined in this survey, users’ views on this topic do not differ in a substantive way based on party affiliation. Democratic and Republican social media users are equally likely to feel that each of these statements describes social media well. Despite their overall negativity toward the political tone on social media, users are largely split on the question of whether this negativity is inherent to the social media environment itself, or whether it simply mirrors the broader political landscape. The survey included a series of questions asking respondents to evaluate the tone and content of the political discussions they see on social media in comparison to other places where people might discuss political issues. And while a substantial share of social media users consider social platforms to be an angrier, less respectful and less civil place than other venues, many indicate they don’t see too much difference between political conversations on social media and those taking place elsewhere. Of the seven different attributes evaluated in the survey, users feel that four in particular describe political interactions on social media relatively well. Roughly half of social media users (53%) feel that the political discussions they see on social media are less respectful than those they see elsewhere, while a similar share feels that these social media discussions are less likely to come to a resolution (51%), less civil (49%) and more angry (49%) than discussions in other venues. 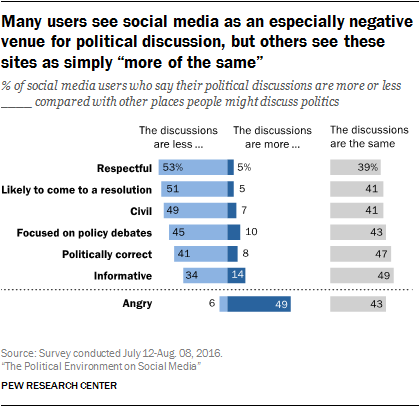 At the same time, a substantial minority of users (ranging from 39% to 43%) feel that social media discussions are about the same as political discussions in other venues in each of these respects. And a small number feel that the political interactions they see on social media are actually an improvement over the interactions they encounter in other spaces. On other attributes evaluated in the survey, users have mixed – but ultimately not particularly positive – views about the tone of political discussions on social media. Some 45% of users feel that political discussions on social media are less focused on important policy debates than conversations they encounter elsewhere, although 10% feel they are more focused on policy and 43% think they are about the same in this regard. Meanwhile, 41% of users feel that social media discussions are less politically correct than other places where people discuss politics, but a majority feels that social media is either more politically correct (8%) or about the same as other venues (47%). Lastly, around one-third (34%) of users consider the political discussions they see on social media to be less informative than those they encounter elsewhere – but 14% say that these discussions are more informative, and 49% say that they are about the same. There is no variation on these questions in terms of party affiliation: Republican and Democratic social media users respond in nearly identical ways on each of these attributes. However, when people’s ideological beliefs are added to the mix, conservative Republicans and liberal Democrats stand out from their peers in seeing social media as a uniquely angry place. Some 56% of conservative Republicans and 59% of liberal Democrats who use social media feel that the political discussions on these platforms are angrier than those occurring elsewhere. That compares with 39% of moderate and liberal Republicans and 37% of conservative and moderate Democrats. When they disagree with political content posted by one of their friends, the vast majority of social media users (83%) say that they usually just ignore the post and move on. However, a minority of users actively engage with political content that they disagree with: 15% indicate that they typically respond to these posts with a comment or post of their own. In general, social media users of various kinds tend to respond to posts they disagree with in similar ways. Men are a bit more likely than women to say that they typically respond with their own post (19% vs. 12%), but there are few other major demographic differences on this question based on age or party affiliation. There is one major exception, however: Users who regularly post political content of their own are much more likely to engage when others post something that they disagree with. One-third (33%) of social media users who often or sometimes discuss or post about political issues say they typically engage with posts they disagree with by responding with their own commentary, compared with just 7% among those who post political content less frequently. Although relatively few social media users consistently wade into contentious political conversations, a notable share takes active steps to filter out certain users or types of content for political reasons. 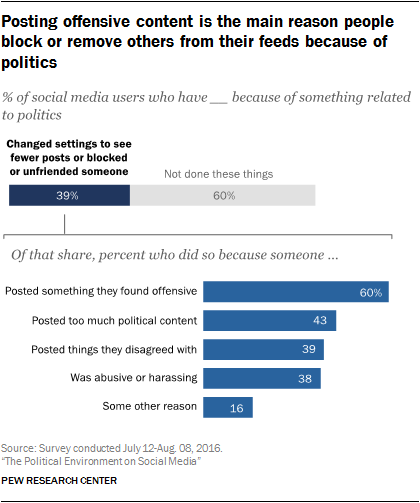 Nearly one-third of social media users (31%) say they have changed their settings in order to see fewer posts from someone in their feeds because of something related to politics, while 27% have blocked or unfriended someone for that reason.2 In total, 39% of social media users have taken at least one of these two steps to mute political content or those who post it. When asked about specific reasons why they might have taken these steps to disconnect from someone they follow, the largest share (60% of these users who have blocked, unfriended or minimized content from someone) indicates that they have taken this step because that person posted something they found offensive: that works out to 23% of all social media users. Smaller shares have blocked or unfollowed someone because that person posted too much political content, posted things that they disagreed with, or because they were abusive or harassing. Pew Research Center has examined this behavior in surveys conducted during the 2012 presidential campaign as well as the 2014 midterm elections. And as was the case in each of those studies, political liberals who use social media are more likely than conservatives to change their settings to see less of someone (41% vs. 26%) as well as to block or unfriend someone (35% vs. 26%) because of something related to politics. Along with political liberals, social media users under the age of 50 are more likely to take these steps than older users. Despite their negative view of the tone of political conversations on social media, some users view social media in a relatively positive light when it comes to facilitating engagement and involvement with political issues. A total of eight-in-ten social media users feel that these platforms help users get involved with issues that matter to them either very (22%) or somewhat (57%) well, while a similar share feels that social media have helped bring new voices into the political discussion very (21%) or somewhat (53%) well. 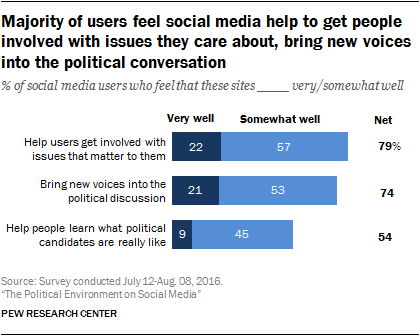 Meanwhile, a slight majority feel that social media help people learn what political candidates are really like very (9%) or somewhat (45%) well. Demographic differences on these questions are relatively modest: For the most part, social media users of various types tend to have similar attitudes toward these platforms when it comes to political involvement. However, there is some variation on these questions around race and ethnicity. Black and Latino users feel relatively strongly that social media help people get involved with issues that matter to them: 27% of blacks and 29% of Latinos feel this describes social media very well, compared with 18% of whites. These groups also respond relatively positively to the notion that social media sites are a good way to learn about what political candidates are really like: 15% of blacks, 17% of Latinos and 6% of whites think this describes social media very well. Along with non-whites, Democrats tend to view social media somewhat more positively than Republicans in the context of political involvement. Some 26% of Democrats who use social media feel that these tools do very well at helping to bring new voices into the political discussion (15% of Republicans feel similarly strongly), while 25% of Democrats (and 18% of Republicans) feel that social media functions very well at helping people get involved with issues that matter to them. As their social connections go about sharing and commenting on political issues, social media users often find their friends’ political opinions differ from what they expect. Indeed, fully half (50%) of social media users say they have been surprised by the political views of someone in their online network because of something that person posted. Another portion of these respondents expressed surprise that someone they knew was more conservative or liberal than they previously thought, while other responses covered a range of issues – including race, the Black Live Matter movement, guns, police and abortion. Despite their often-negative views about the political interactions they see on social media, people can sometimes end up changing their minds about political matters after these encounters. One-in-five social media users (20%) say they have modified their views about a political or social issue because of something they saw on social media, while 17% say they have modified their views about a particular political candidate. Candidates for office are increasingly using social media to reach out directly to the public, and this survey finds that 25% of social media users follow candidates or other political figures on various social media platforms. When asked about the types of figures they follow, roughly two-thirds of these users (65%) say they mostly follow people who share their own political views. Another 31% say they follow a mix of people with different political views, while a small minority (3%) say they mostly follow people who do not share their views (a practice that is sometimes referred to as “hate-following”). A previous Pew Research Center study found that a similar share of Americans have engaged with social media content from each of the two major-party candidates for president this election season, and in this survey a similar share of Republican and Democratic social media users indicate that they follow political figures and candidates. 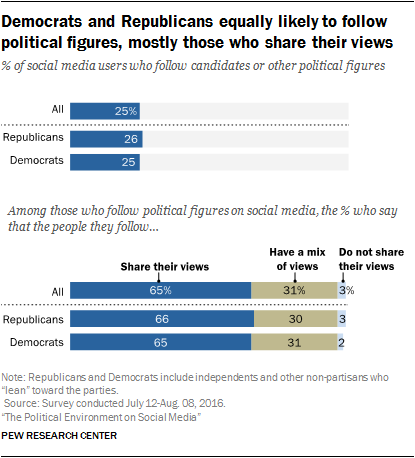 Republicans and Democrats also report that they follow a similar mix of people they agree with and people whose views they do not share. Social media users who follow at least some political figures with whom they disagree provide several reasons for doing so. By far the most common is that they simply want to stay informed about what people on both sides of the political debate are saying: 86% of these users cite this as a reason. A much smaller share indicates that they follow political figures they disagree with because they find it entertaining (26%), because they like to argue with the other side’s followers (14%) or because they like to share information with their own followers that makes the other side look bad (12%).